A high pressure system brought two days of nothing but clear blue skies to Southcentral Alaska. 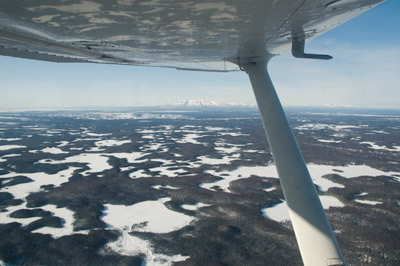 It was so clear that the current weather report called for 100 mile visibility over Talkeetna. After getting an updated briefing and going over my flight plan with my instructor, Mark filled out the proper endorsement in my logbook and sent me on my way. I’d been a bit nervous during the past couple of days thinking about this flight. I think most of it was that I had never landed at any other airports besides Merrill by myself. Up to this point, I had not flown solo anywhere, except in the traffic pattern and in the practice area, but for some reason, it was thinking about the landing part that made me a little nervous. That said, I was looking forward to practicing some solo landings, which I had not had the chance to do for a couple of weeks. I’d built a side trip to Birchwood on the way back intending to do a couple of touch and go’s. 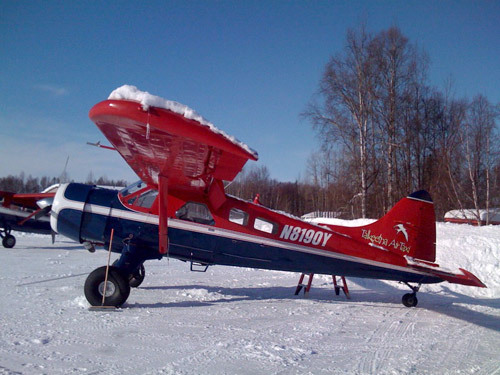 The idea of flying solo to Talkeetna had been an exciting prospect for me and I’d been looking forward to it ever since I started my lessons. Having flown with Talkeetna Air Taxi before and knowing some of the people who work there, I’d always wanted to go back and walk into the office after flying there myself. Also, I wore my TAT t-shirt for my first solo, and since it got cut up, I’d wanted to go and buy the symbolic replacement shirt. My taxi and takeoff went without a hitch, and when I crossed over the Knik Arm, I climbed to 2,500 feet, tuned my VOR 1 to the Big Lake frequency and turned to track the inbound signal. Looking out my left window, I could see Mt. 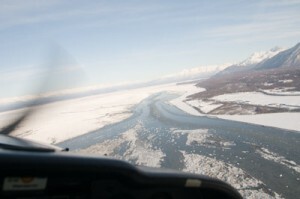 Susitna off to the west. The air was smooth up there, although I could tell that there was a slight headwind. After flying over the Big Lake VOR, I turned to track the outbound 330° radial. 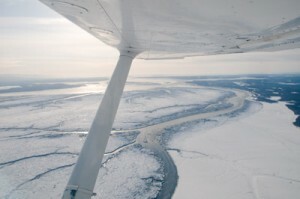 Soon, I flew over the Willow airport and veered closer to the large, braided Susitna River. To the Northwest, I could see the three big mountains, Denali, Foraker and Hunter. I didn’t see any other planes, but along the way, I tuned into the common frequency to monitor traffic over the surrounding airports. 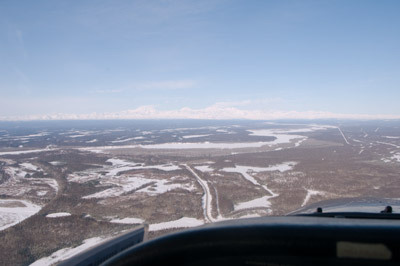 Eventually, I saw up ahead where the river split, and soon after, the Talkeetna airport came into view. I listened to the ATIS to get current weather and runway info and then called up Talkeetna traffic to announce myself inbound. I thought about making a slight left turn and then coming in on a long final approach to runway 36, but during my final descent, an Otter announced itself coming in from the northwest, so I got into the pattern and followed it all the way around as I watched the Otter come in for a landing. My final descent was smooth and my own landing went very well- my best solo effort yet, even though the runway was covered in snow and grooved ice. 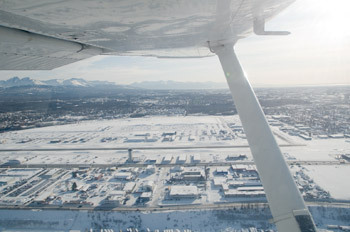 I taxied off the runway to the transient parking, secured my C172 and proceeded to the Talkeetna Air Taxi office to see of Paul Rodderick, the owner was there. Turns out, it was him in the Otter that landed just in front of me. I showed him ‘ruined’ TAT shirt and told him that I was on my first cross country solo. He and Sandra the office manager congratulated me and then Paul gave me another shirt. We talked about planes and flying for a bit and then I thanked him and went out to the garage to visit with Danielle, the TAT mechanic who was our pilot into the Pika Glacier. When I was about ready to depart, I called my dad, ate my sandwich and then pulled the plane around to face the taxiway, figuring that it would be easier than trying to make a tight turn with the engine on. I followed a K2 Aviation C185 on skis to the runway, did my runup and took off behind him. Once in the air I climbed back to 2,500 feet and turned south. While I’d used VOR navigation on the way up, I had decided to use pilotage and dead reckoning on the way back. I followed the road (there is only one- the Parks Highway), and the river back down over Willow, looking for my checkpoints along the way, then turned and flew over Houston. I’d forgotten to adjust for magnetic deviation when I turned after Willow and ended up south of Houston, but looking at the map, I spotted a place where the road and railroad met where I could cross reference with the Big Lake VOR 360° radial. When I passed that point, I turned right, this time correcting for deviation, passed Wasilla to the south and headed out over the Knik Arm. Spotting Birchwood on the other side of the water, I tuned into the AWOS and the CTAF frequencies and began my descent to runway 19R. On my final approach, something didn’t quite look right, the runway seemed awful narrow, and I wondered for a moment if it was the taxiway that I was lined up on. Since I wasn’t 100% sure, I pushed in the power and did a go around. During my climbout, I glanced over my shoulder to watch another plane takeoff and confirm that it was indeed the runway. I had snowed the day before and they had only cleared it one plow width wide. I came back around and did two touch and go’s. My pattern could have been better, but my landings were not bad. Climbing out after the second one, I veered left to get on other side of the Glen Highway and headed back to Anchorage. 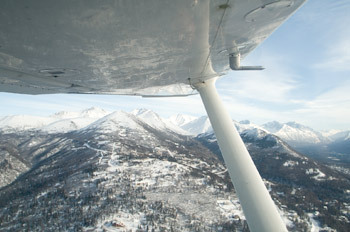 Short, but nice fight back to town along the Chugach foothills and over Eagle River. When I had Merrill Field in sight, I listened to the ATIS and called up the tower. I had to call back to confirm that it was left traffic on runway 7, which is different than usual. The cleared me for landing, but since I was not used to left traffic on 7, I ended up making my turns to base and final too soon and ended up coming in too high. I was a little disappointed that my final landing was not nearly as good as my others from the day, but I shook it off, taxied back to the hangar. After a quick brief with Mark, I filled out my logbook and rode home, very elated. It had been a very special and successful flight. Not everything went perfectly, but most things went really well, which, in my mind, made it a very productive lesson, not to mention a great experience flying. This entry was posted in Flight Lessons and tagged Birchwood, cross country, N52654 Cessna 172, Solo Flight, Talkeetna, touch and go's. Bookmark the permalink.